By Dr. Paula C. Ko, M.D. As a retina specialist, we see many patients with eye problems that are a direct consequence of a systemic disease. In addition, there are some retinal diseases that can be modified by controlling an associated systemic disease. As a result, retina specialists commonly evaluate the patient as a whole, not just an eye. Diabetes, high blood pressure and high cholesterol are all systemic diseases that can directly cause significant vision loss. While surgical intervention can be very effective, we are also mindful of the root of the problem; systemic disease which is commonly not well controlled. When a patient has vision loss, it is imperative that we coordinate systemic disease care with a patient’s PCP. Educating patients about the causes of vision loss from systemic disease can not only help treat, but may prevent vision loss from happening in the first place. Injections into the vitreous cavity of the eye is a large part of how retinal specialists treat retinal diseases today. Preventing and modifying systemic disease is equally important. The following are some diet suggestions which along with exercise, are the basic building blocks of health! Blindness from diabetes is more prevalent with poor diabetic control. In order to decrease the risk of blindness, the American Diabetic Association recommends that a patient keep their HBA1C less than 7. The best way to keep blood sugars low is to decrease carbohydrate consumption. Below are examples of food substitutions that have low glycemic index’s which will help keep the HBA1C low. Retinal vein and artery occlusions typically occur in people who have high blood pressure, high cholesterol and diabetes. Injections can help improve vision which is typically done on a monthly basis. Making sure that diabetes, high blood pressure, and high cholesterol are well controlled will help with the overall visual outcome. Controlling systemic disease can also help decrease the amount of injections patients will need. High blood pressure and high cholesterol can exacerbate the complications of this very common eye disease. While there is no cure for the dry form of AMD, monthly injections are very successful in stabilizing and improving vision in wet AMD. In addition smoking can make AMD worse. The following diet is helpful for patients with AMD. Brisk walking is great exercise. Doing this at least 30 minutes a day helps decrease the HBA1C, aids in weight loss and promotes circulation. Walking also decreases cholesterol and blood pressure. Exercising with a friend, spouse, or pet will statistically increase your chances of keeping up this routine. Make sure you wear your sunglasses when you are out for your brisk walk! Quitting smoking is difficult, and in order to be successful it usually needs to be replaced with another habit. If you are a smoker, why not replace it with walking! If you would like to keep up with healthy ideas and recipes for the eyes, as well as learn about the newest treatments available for eye disease, you can follow us on facebook, instagram, and our website at eyephysicians.com. Dr. Ko has an area of special expertise in retinal problems, especially diabetic eye disease, macular degeneration, and retinal detachment. Dr. Ko has lectured extensively, and has published many papers on these topics. Dr. Ko is active in resident training, and is on staff at Temple University, as well as at the Medical Center of DE. 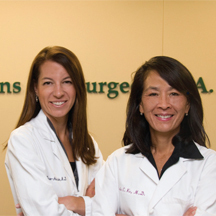 Dr. Ko is at the forefront of ophthalmic technology, and utilizes the most advanced procedures, including laser treatment and intraocular injections, in the care of her patients.